The term Neanderthal is synonymous with “caveman” and implies a person who is primitive, backward, brutish, and generally not much better than an ape. Where did this conception of Neanderthal man come from? In 1908, a Neanderthal skeleton was discovered in a cave in southern France, near the village of La Chapelle-aux-Saints (the chapel of saints). A French anthropologist named Marcellin Boule drew the task of reconstructing and mounting the skeleton, which came to be called the “old man” of La Chapelle. Boule’s examination of the specimen’s spine indicated that the old man could not walk upright, so Boule placed him in a stooped-over posture. Boule concluded that the old man could not fully extend his legs and must have walked with a bent-kneed gait. Boule envisioned the old man walking pigeon-toed, on the outer edges of his feet. He spread the big toes apart from the other toes, in an ape-like manner. Boule positioned the specimen’s head jutting forward, in an ape-like attitude. Boule published his conclusions in a French scientific journal in 1911. It would be more than forty years before Boule’s view of the Neanderthals was seriously questioned; his interpretation dominated scientific thought throughout the first half of the twentieth century. The Neanderthals’ basic humanity is beyond question. There is evidence that their burials were conducted with tender ritual. [vi] The Neanderthal at La Chapelle was buried with “beautiful pieces of jasper” arranged around his head. [vii] A flute has been found at a Neanderthal campsite, showing that Neanderthals could produce and enjoy music. 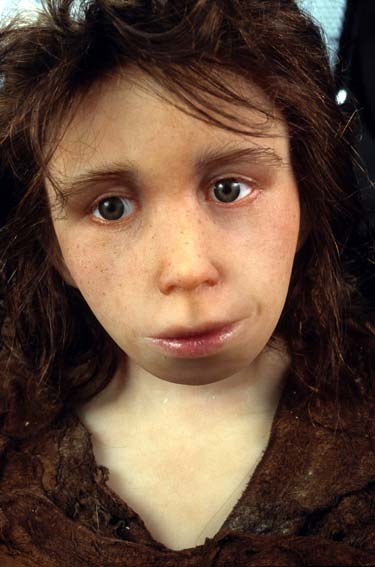 [viii] Below is a recent reconstruction of a four-year old Neanderthal child, showing her to be only trivially different from a modern human being. Boule’s blunder was not the result of incompetence. Boule was world renowned, one of the top men in his field. But he was a Darwinist. He believed that men had evolved from apes, and when he examined ancient human remains, he expected to see ape-like qualities. When he studied the remains of the “old man” of La Chapelle-aux-Saints, Darwinian expectations blinded him to the possibility that what he was seeing was the result of disease and did not reflect the normal Neanderthal condition. His reconstruction of Neanderthal was more the result of his Darwinian beliefs than of anything in the bones themselves. It is, in fact, a common fantasy, promulgated mostly by the scientific profession itself, that in the search for objective truth, data dictate conclusions. . . . Data are just as often molded to fit preferred conclusions. And the interesting question then becomes “What shapes the preference of an individual or group of researchers?” not “What is truth?” It is clear that Boule went beyond the evidence of his eyes—perhaps to press more persuasively his version of the Truth. And Boule’s interpretation of Neanderthal became part of the body of scientific knowledge, as reflected in museum displays and textbooks, for half a century. [i] Lubenow, Marvin L., Bones of Contention, (Grand Rapids, MI: Baker Book House, 1992), pp. 59-61. [iii] Lewin, Roger, Bones of Contention (New York: Simon & Schuster, 1987), p. 67, quoting C. Loring Brace. [iv] Straus, William L., and A.J.E. Cave, “Pathology and the posture of Neanderthal Man,” Quarterly Review of Biology, vol. 32, pp. 348-363 (December, 1957). [v] Scientists have long debated whether Neanderthals interbred with anatomically modern humans, and whether they should be considered the same species or a separate one. This is still a live controversy. Some skeletal remains show a mixture of Neanderthal and more modern characteristics. “This skeleton demonstrates that early modern humans and Neanderthals are not all that different,” commented Dr. Erik Trinkaus, on Neanderthal remains found in Portugul. “They intermixed, interbred and produced offspring.” Dr. Milford Wolpoff of the University of Michigan states that the find, “shows that fundamentally, Neanderthals are the same species we are and they contributed their genes to European ancestry.” See John Noble Wilford, “Discovery Suggests Humans are a bit Neanderthal,” The New York Times, April 25, 1999. The Neanderthal story has a dark side. A Neanderthal site in Krapina, Croatia, discovered in 1899, seemed to show signs of cannibalism. Research conducted one hundred years later at a Neanderthal site in southeastern France confirmed that Neanderthals sometimes practiced cannibalism. The Neanderthal bones had marks made by stone cutting tools, indicative of the flesh having been stripped off the bones. All of the large bones had been smashed with stones, presumably to extract marrow. [vi] At Shanidar Cave in Iraq, the body of a Neanderthal was carefully placed in the fetal position on a bed of woven woody horsetail and surrounded with several different species of flowers. “From the orderly distribution of [pollen] grains around the fossil remains,” researchers reported, “there is no question that the flowers were arranged deliberately . . .” Leaky, Richard and Roger Lewin, Origins, (New York: E.P. Dutton, 1977), p. 125. The flower specimens, including yarrow, cornflowers, St. Banaby’s thistle, groundsel, grape hyacinths, woody horsetail, and mallow, have medicinal qualities which “range from relief from toothache and inflammation to uses as poultices and for spasm.” Solecki, Ralph, Shanidar: The First Flower People (New York: Knopf, 1971), p. 249. The Shanidar Neanderthals were probably aware of at least some of the medicinal properties of the flowers. Leaky and Lewin, supra, at 125. See also Belfer-Cohen, A., Hovers, E. (1992) “In the eye of the beholder: Mousterian and Natufian burial in the Levant.” Current Anthropology. 33:463-471; Hayden, B. (1993) “The cultural capacities of Neanderthals: A review and reevaluation.” Journal of Human Evolution. 24:113-146; Marshack, A. (1990) “Early hominid symbolism and evolution of the human capacity.” In (P. Mellars ed.) The Emergence of Modern Humans, pp. 457-498. Ithica, NY: Cornell University Press. [vii] Cuozzo, Jack, Buried Alive: the Startling Truth about Neanderthal Man, (Green Forest, AK: Master Books, 1998), pp. 121, 122. [viii] Wilford, John Noble, “Playing of Flute May Have Graced Neanderthal Fire,” The New York Times, October 29, 1996. Archaeologist Ivan Turk found the flute at a site in Slovenia. It had been made from a juvenile bear femur and had two intact pierced holes and two other punctured holes that had partially eroded or had been chewed away. The straight alignment of the holes suggests that a Neanderthal had intentionally manufactured them. Musicologist Bob Fink analyzed this flute and showed that it would have produced four notes and that it had half and full tones. Neanderthals must have used the seven-note scale, the basic formula of western music. Fink states that “the distance between the second and third holes on the old flute is double that between the third and fourth.” This means that the first distance represents a full note, and the distance next to it a half note. Fink says, “These three notes … are inescapably diatonic and will sound like a near-perfect fit within any kind of standard diatonic scale, modern or antique. (See “Neanderthals Lived Harmoniously,” Academic Press Daily Insight, (April 4, 1997). [ix] Lewin, supra, at 68.